It's already time for another Phone-A-Friend! But first, we just want to take a minuto to say THANKS to everyone who has "phoned" in. It has been so fun to hear about all the stuff our readers are into... you are all so inspiring!! So here's the story. Maybe it's because I'm 5 months pregnant and nesting and have this stuff on the brain. Maybe it's because I don't know anything about patterns or colors or mixing, and so I'm just realizing that I've devoted my life to espresso colored furniture and neutral olive/gray/taupe microsuede. Maybe it's because I basically have no personal style and I'm suddenly starting to notice the lack of it. We've got some nice-ish pieces, and we can't afford a major overhaul, especially with a baby on the way. I have dreams of refinishing furniture and antiquing and mirrored tables and distressed shabby whatevers, but basically as soon as I start to look at options, I get overwhelmed and buy something neutral instead. The living room area is to the left, and has a too-large taupe microsuede couch (that we HATE-- it's next on our list of big purchases. Seriously. I want to punch it in the face), a coffee table sitting on a too-small rug. There's also a crap espresso TV stand that we're getting rid of. 1. 2 smallish accent chairs (Ive been looking at patterned/upholstered but am totally open), relatively low profile since they need to fit under our gigantic wall-mounted tv. 2. A small 3-shelf cabinet of some kind, to put tv/game consoles on. I was looking at glass for a while, then veered back into espresso and gave up. 3. Rugs-- can we have one under the dining table and one in the living space and have them be different patterns but still work? It sounds like insanity to me, but maybe. 4. And throws/accent pillows/decorative accents that will give the place some life. Save me from myself before I buy some kind of brown vase with sticks in it! I've been into oranges and yellows lately, but I TOTALLY defer to your genius on the matter. A few ideas of what I've been looking at are on my pinterest page. Both Emily Henderson. Duh. So, on to our actual suggestions. We decided to work with what you are leaning to these days and go with main colors of yellow and blue with tiny touches of coraly/orangey pops. Check it out! 1. Accent Chairs. We thought it might be better to get something neutral but with textural interest to mix it up, since pattern trends come and go so quickly. But these chairs are begging for a bold pillow. We think that blue ones like that could be just right. If wicker isnt your thing, what about these ol' standbys? 2. TV Stand. This is a little softer than the usual, but it is also a little boring. We think jazzing it up with some pretty yellow knobs would be cute! This one is a little pricey though, so this one from IKEA could also do the trick! 3. Rugs. 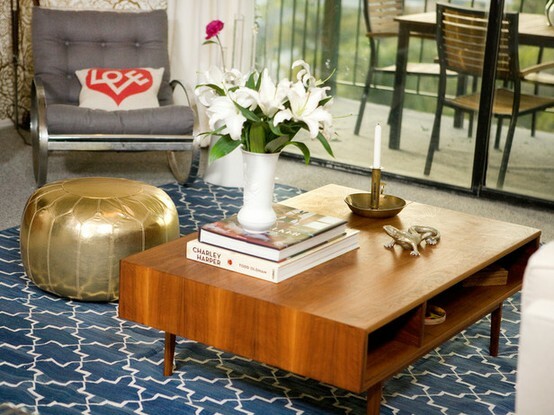 We love the mix of a pattern and a jute rug in the same room/area. That particular jute has a smidge of blue in it so it could look really nice with accents. 4. Decorative Elements. Quick break down: Blythe just added a bunch of plants to her living room and found it life-changing. We chose pillows from Etsy, but suggest buying the inserts from IKEA on the cheap. The little bowls could go on the coffee table or the mantle. We thought that lamp was oh-so-cute with the blue cord and added a little more sleek/modern contrast to the wicker. The throw is basic but classic and the floor pillow is for when all the throngs of people come to "ooh and ahhh" once your little baby is born! BONUS: Art. We chose prints of a similar color scheme to the room but that had some sentimetal value: (Amanda and her husband are actors and Pirates of Penzance was one of their first plays together, and the Paris one, well, we simply stole from Amanda's Pinterest page). We also think some big blown up photos from your wedding in Mexico could be perfect in there. Yummy blue ocean! BONUS: Would you consider painting? We see you have one taupe-ish wall, so that leads us to believe you are open to it. Its the cheapest way to have BIG impact. Since the rug is yellow, we thought a gray blue could look really nice. Maybe with some white curtains? Phew. That's it for now! We hope you like it and can't wait to hear what you end up doing! Squeeeeee!!! So excited. Thank you, thank you, thank you! You guys are awesome. I LOVE the idea of wicker chairs (although, will they feel as good in the wintertime?) and playing with texture rather than upholstery. Smart. Yay! So glad you like it. We can't wait to see what you do! Wicker: We both love wicker lots (in moderation of course) and think it's definitely year-round. 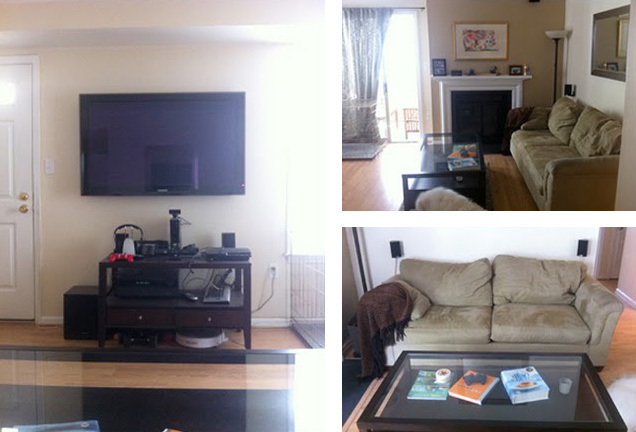 Rugs: We would use the yellow rug for the living room and a jute under the dining room table. No rules on round/square/rectangle, totally up to you. Hi ladies! Well, we got the yellow rug (thanks, craigslist!). The pile is a little different than we expected, but it's already helping to add a little character. Both the West Elm rug and the C&B chairs have sold out already (damn!) but we'll keep looking for something similar. Thanks again-- we'll send photos as soon as it's in any shape! Me again. OK, so I'm coming to terms with the fact that the C&B chairs are gone and not coming back. How do we feel about these? Do they have the same effect? Love 'em. I think they're perfect, and you can't beat that price! Me again with more questions as we slooooowly work on the living room. We are buying those World MArket chairs this weekend, and I have a pillow question. I'm hopeless, I know. Should I get matching pillows for the 2 chairs and different pillows for the eventual couch, or should I get a different pillow for each of the 2 chairs? I'm thinking like, same colors but one patterned and one with a big graphic? Thoughts? Hey hey! Pillows are our middle name! I love the idea of two different pillows that coordinate with one another but are not exactly the same. I think that chairs are enough of a matching statement. Also, YAY about the chairs. They are great and congratulations -- furniture decision-making deserves a lot of kudos in my book! Shop comfortable ergonomic kneeling chairs for sale for office computing applications. Fabric, mesh, and leather ergonomic chairs available from best selling brands like Eurotech, Offices To Go, Mayline, and more.